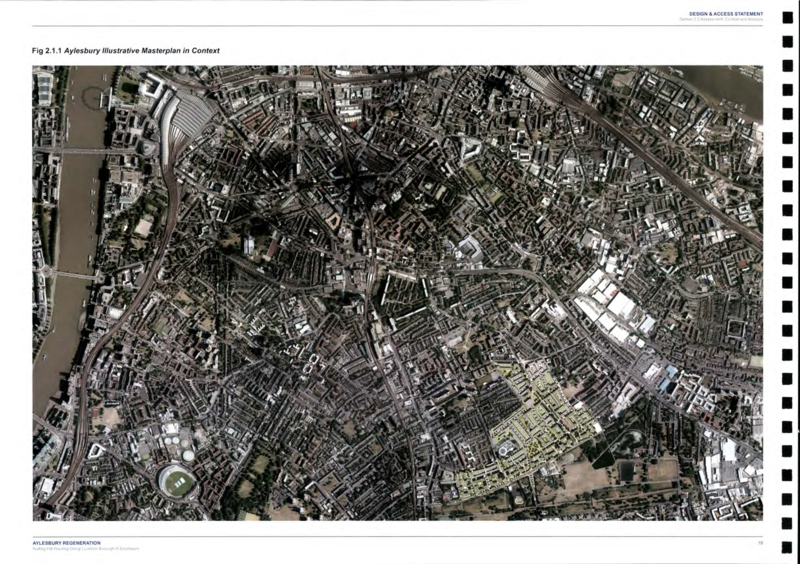 After waiting over a month for them to be ‘validated’ by the council, the planning documents for the Aylesbury estate revelopment are now online. The application for the First Development Site seeks permission to demolish the Bradenham, Chartridge & Chiltern blocks comprising 630 homes and replace them with 815 new homes (ref:14-AP-3843); 362 of these will be at ‘target rent’ - a net loss of 204 units (provided that target rent is equivalent to social rent). The amount of free market housing on this first phase will increase from 64 homes (initially bought under right-to-buy) to 412 and there will also be 102 intermediate units. The 204 social rented units lost on the first phase is a fraction of the total net loss from the Aylesbury regeneration as a whole. The Housing Statement for the outline application (2,735 new homes - ref:14/AP/3844) shows that the social rented housing provision will be reduced by over a third, with a net loss of 934 social rented homes across the estate once the regeneration is completed. Target Rent = affordable rent or social rent? 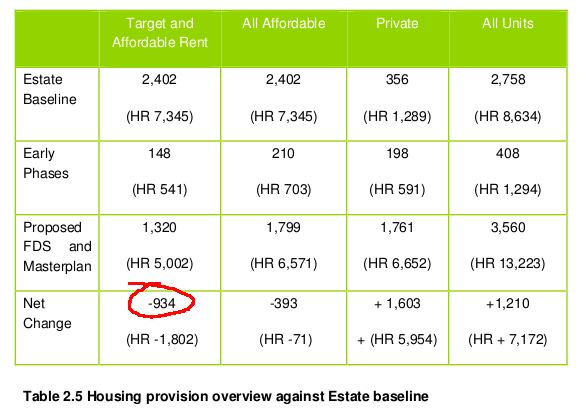 The table in paragraph 5.11 of the Housing Statement, describes ‘Estate Baseline’ homes as ‘Target and Affordable Rent’ which they never were; they were council homes at council rents. Using ‘target rent’, ‘affordable rent’ and ‘social rent’ as if they are all the same thing confuses and misleads. What people really need to know is how much total rent will new-build tenants be paying, whatever the housing is called? The previous phase of the Aylesbury redevelopment currently under construction by L&Q gives good reason to worry on this point: as we reported in a previous blog post, the legal agreement for that phase contains a definition of ‘social rented’, which refers to the HCA definition of Boris Johnson’s ‘affordable rented’ housing product of up to 80% market rent. One would normally expect to find a reference to the National Rent Regime under the definition of social rented housing in such documents. This is the regulatory framework which decides the level of social rents based - among other things - on the average level of income. Here is an example of the wording normally used in Southwark’s legal agreements securing planning obligations. Before the legal agreement securing the Aylesbury planning obligations can be signed, the application has to be approved by Southwark’s planning committee; Southwark is also a partner in the regeneration, so it is up to Southwark to ensure that this situation is not repeated and we don’t end up with ‘social rented housing’ that is nothing of the kind. The council recently announced plans for a ‘Southwark Spine’ cycle route linking the south to the north of the borough, which is due to cut straight through the new Aylesbury development1. 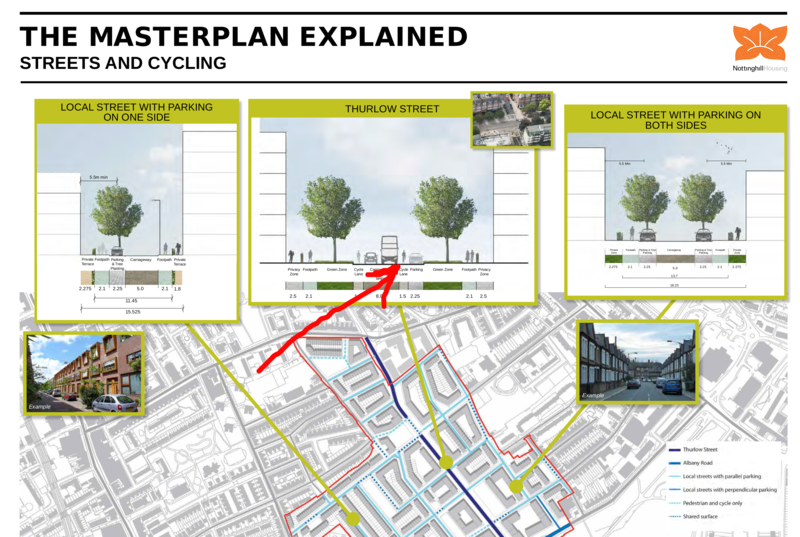 However, cycle campaign groups have pointed out that the planning applications make no provision for any segregated cycle lanes, instead cyclists will be forced to continue to compete for road space on Thurlow street with buses and cars as the illustrations here show. A petition has been set up by cycle campaign group http://stopkillingcyclists.org. Planning regulations require major redevelopment applications to provide “An outline of the main alternatives studied by the applicant or appellant and an indication of the main reasons for the choice made, taking into account the environmental effects.” This is to ensure that developers have properly considered the environmental impact of their proposals against the possible lower impact of alternatives and refurbishment. It would appear that no such appraisal or any detailed cost/benefit analysis has been undertaken in relation to the Aylesbury redevelopment. UCL’s Engineering Exchange recently published a detailed report showing that “refurbishment of housing is often preferable to demolition and reconstruction” when taking into account environmental and social factors. We saw with the Heygate that wholesale decant and demolition costs can far outstrip refurbishment costs: the council spent £65m emptying2 & £15m demolishing3 the Heygate when comprehensive refurbishment would have cost just £35m4. Council papers state that “the Aylesbury is a very diverse community with 67% of people belonging to a minority ethnic group”. According to the Equalities Act 2010, the planning application should have included a detailed equalities impact assessment to consider whether the planning proposals will have an adverse effect on any Black and Minority Ethnic(BME) groups. We have been unable to find any such assessment in the supporting documents for either application.